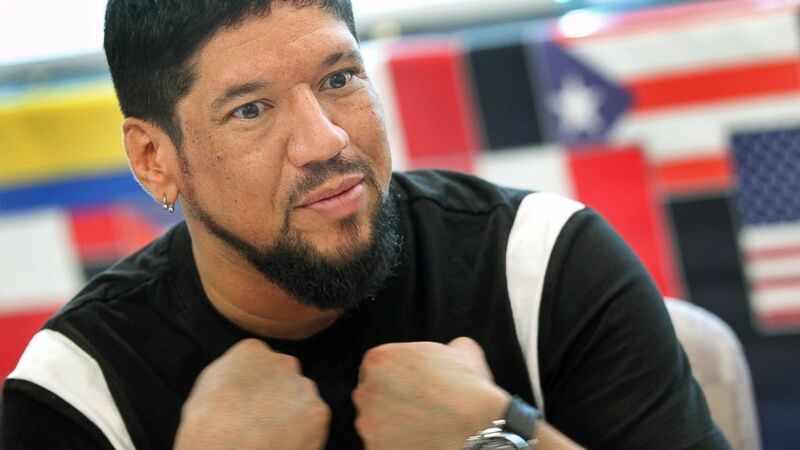 Ricardo Querales has been in the United States for 15 years. A hair stylist in Miami says he is being deported to his death. The U.S. government has ordered Ricardo Querales to buy a ticket to his home country of Venezuela in two weeks. But because he is HIV-positive, the 43-year-old gay immigrant, who has been in the United States for 15 years, worries he will have no access to the medication he needs to survive. 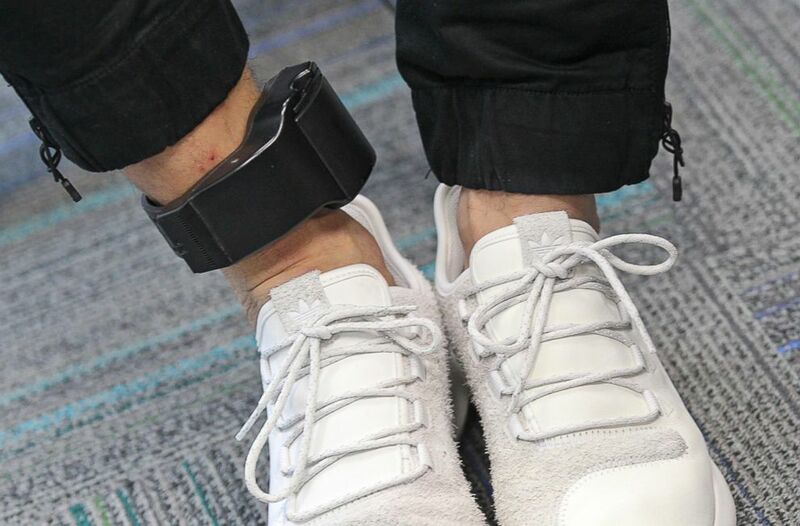 “I tell to the officer, immigration officer, when he send me to put my [GPS monitoring] bracelet, I said, ‘That’s not right. You’re sending me to death,’” Querales told ABC News. (C.M. Guerrero/Miami Herald/TNS via Getty Images) Ricardo Querales, an HIV positive Venezuelan man who has been required to wear an ankle monitor, is pictured on Jan. 31, 2018. “He has currently an order of removal, and so we are working diligently on preparing what’s called a stay of removal ... basically a request to the field director for ICE (U.S. Immigration and Customs Enforcement) ... to ask them to not execute or to not remove him based on humanitarian reasons, in this particular case,” De Sautu told ABC News. Querales has “a really compelling case, based on his condition,” De Sautu, who specializes in immigration law, said. (C.M. Guerrero/Miami Herald/TNS via Getty Images) Ricardo Querales has HIV and will be deported back to Venezuela, where he says he will die because there is no medication to treat his illness, on Jan. 31, 2018. But Querales’ criminal record is also likely to factor into the case. 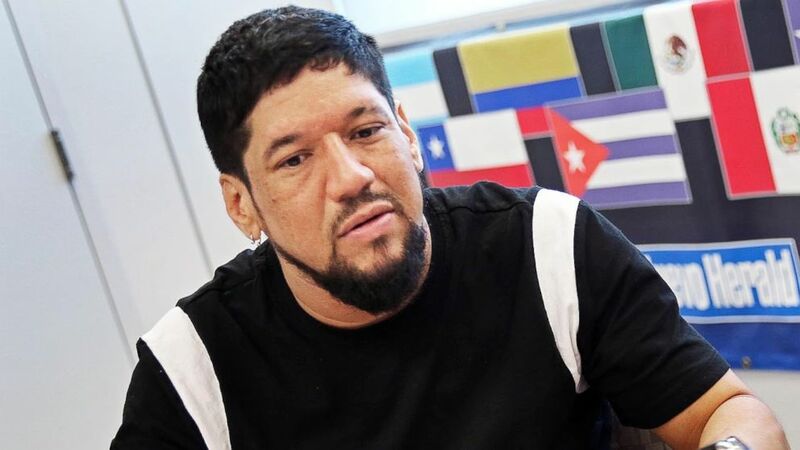 Querales, who said he fled Venezuela to escape the late authoritarian President Hugo Chavez, arrived in the United States in 2003 and was granted asylum a year later. He learned he was HIV-positive in 2006. Three years later, he was convicted for controlled substance possession and drug paraphernalia possession with intent to use in 2009, and later spent six months in detention while in ICE custody related to a different case that included no charges. A judge issued his deportation order in 2011 that was not immediately carried out and he was placed on an "Order of Supervision" in 2014, requiring scheduled check-ins with ICE, according to according to the Miami Herald. Querales now blames the Trump administration for last month’s decision to seek deportation. "I think it's because after Trump, all the Trump thing, they knew now they want to get me out of the country with," he told ABC News. Immigration and Customs Enforcement directed ABC News to the Executive Office for Immigration Review (EOIR), which is a part of the Department of Justice and adjudicates immigration cases. A DOJ spokesman could not comment specifically on Querales’ case because of privacy constraints, and declined to comment generally on what role, if any, medical conditions and criminal histories play in deportation decisions. 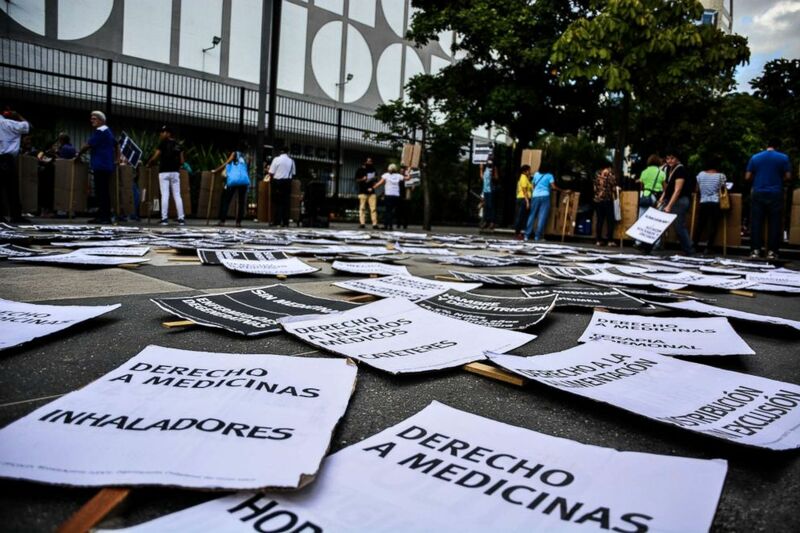 (Roman Camacho/NurPhoto via Getty Images) Signs lie on the ground as demonstrators take to the streets of Caracas, Venezuela on Nov. 30, 2017 to protest against the country's lack of medicine and general health crisis. A EOIR fact sheet issued in December 2017 about immigration decisions notes that asylum can be granted for individuals "because of past persecution or a well-founded fear of future persecution on account of their race, religion, nationality, membership in a particular social group, or political opinion." Laura Lynch, a senior policy associate at the American Immigration Lawyers Association, said deportation agents typically “weigh a set of factors when deciding who's a priority for removal." "Under the Trump administration, they say it's a case-by-case scenario, so the ICE agents or ICE officers" determine "whether or not Ricardo can stay in the U.S.," Lynch told ABC News today. "What we're seeing here at AILA is the Trump administration is deporting vulnerable individuals like Ricardo that were not a priority under the Obama administration," she added. "The administration is moving forward with deporting low-hanging fruit such as individuals they can easily identify," she said, specifically citing people who have previously scheduled appointments to check in with ICE. Querales has friends and family, including his mother and brother, who still live in Venezuela, but that does little to mitigate his concerns about being forced back. "She [his mother] cries every day because she knows that I’m HIV-positive" and wouldn't be able to get the proper medication in Venezuela, where ongoing political chaos and economic upheaval have led to a scarcity of food and medicine, he said. “We no have human rights there,” Querales said.